Cranberries are a tangy berry that is native to North America. The growers of cranberries flood the fields with water when the berries are ripe to make picking the low-bush berries easier. As a woman, drinking cranberry juice has some definite benefits to you, including possible prevention of some infections and providing healthy nutrients. Unsweetened cranberry juice contains 116 calories per 8 oz. If you drink 2 cups of cranberry juice a day, you will consume 13 percent of your daily calories, if you eat an average of 1,800 calories per day. The juice contains trace amounts of protein and fats, and 30.61 g of naturally occurring sugar. A cup contains about 24 mg of vitamin C, or about 30 percent of an adult woman’s 75 mg requirement. The juice contains trace amounts of the B vitamins riboflavin, niacin, B-6 and thiamin and small amounts of vitamin A, choline and folate. Urinary tract infections, which are more common in females than males, may be prevented by drinking cranberry juice regularly, according to the National Center for Complementary and Alternative Medicine. The cranberry juice may help prevent bacteria, which naturally accumulate along the urinary tract walls, from causing infections. If you suspect a urinary tract infection, consult your doctor for treatment. 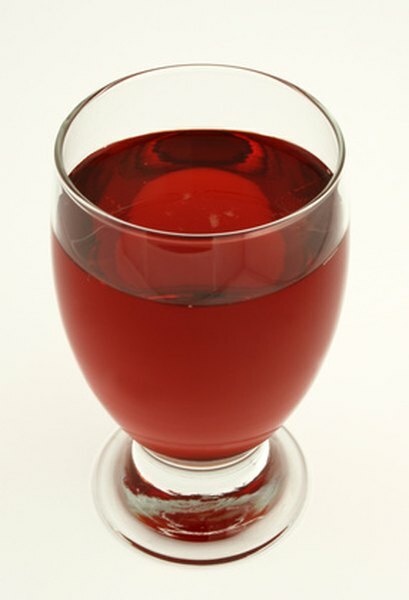 NCCAM indicates that cranberry juice does not cure urinary tract infections in females. A small group of women suffering from metabolic syndrome participated in a study published in the March 2011 issue of the journal “Nutrition Research.” The study examined whether low-calorie cranberry juice would improve the lipid oxidation, which contributes to your body’s immune system, cell health and aging and, according to Case Western Reserve University, can affect your cardiovascular health. The study also studied the effects of cranberry juice on the plasma antioxidant capacity, or the effect of the juice's antioxidants on women’s blood. The study found that by drinking about 2 cups of low-calorie cranberry juice each day, the women in the study experienced a reduction in their body’s lipid oxidation, while enjoying an increase in their plasma antioxidant capacity. Although cranberry juice has benefits to you as a woman, the calories in the juice may cause you to unintentionally gain weight, if you do not adjust your food intake to account for the additional calories. Consider diluting 8 oz. of cranberry juice with 4 oz. of water to reduce the calorie count. If you choose to drink a diet cranberry drink, you will reduce the calories and the sugars by one-third and consume your full day’s vitamin C requirement in 1 cup.